This was going to be a Five for Friday kind of post. Then I ended up spending Friday evening in a Benadryl haze. Annelise and I have had the sneakiest cough-cold-allergy-mystery illness for the last sweet forever. I say sneaky because we think we've whipped it and then, BAM, it's back, mocking us. Benadryl led to Mucinex which led to NyQuil last night (for me) and not to jinx everything but... I feel a smidge better today. Still cough-y but not prone on the couch clutching my Kleenex in a death grip, so that's progress. I spent a chunk of time today cleaning Annelise's room and bathroom, which left me equal parts proud of myself and mad at myself (and truth be told, a bit frustrated with her too). Proud because I cleaned out a bunch of clutter that had been in her bathroom cabinets and drawers for years for no good reason but mad too because of 1.) the general nastiness and the fact she's been telling me she's done this or that (picking up her room, cleaning her sink, et cetera) and well, we obviously have highly divergent ideas of what picking up and cleaning actually mean (or she gets distracted 1/4 of the way through...SQUIRREL!...and abandons everything) and b.) the fact I haven't been checking her room or bathroom regularly, because honestly, it's rarely pleasant and it tends to lead to raised voices and tempers flaring, so I've been in denial. And lazy. I think it's time (er...again) to try to have more structure, like a weekly schedule or job chart. For both of us. In other news, Friday afternoon was frought with drama (before the Benadryl). Annelise was bebopping her way into the garage to get her bicycle to ride over to Pappo and Grandma's house (two doors down, but not the Dolly Parton song) for a quick visit when we heard blood curdling screams (you know, the real ones) and she burst back into the house red faced, shaking and crying. There was a snake in the garage. It was a water moccasin. The good news is she had barely stepped into the garage and luckily wasn't too close to it (but still) and it went into a defensive position with its scary teeth bared which actually *froze it* for a moment or two, which was long enough for our handy dandy neighbor Mr. Richard to whack its head off with a hoe. 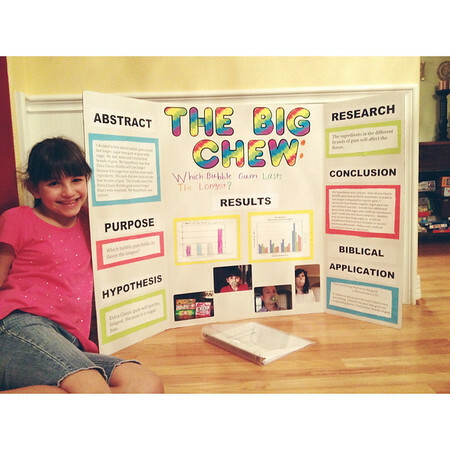 In other non-snake related news, Annelise and her team (AKA: us) finished her science fair project in the nick of time. 9:25 Wednesday night and it was of course due the next morning. What? Technically we still had plenty of time. While it was something of a team effort, she did the majority of the work herself (really), she typed everything out, drew one graph herself and Scott helped create another one on the computer. She used my decorative scissors to trim her pages, so that's why they look a little wonky, which I kind of love anyway and then hand wrote the question part of her title. Scott and I took over the glue-sticking and layout so it would be straight, or at least basically straight. She was pretty proud of herself. And I could NOT wait to drive the fool thing to school Thursday morning and say, Sayanora Sucker, or at least buh-bye. Whichever. So now, in closing (cue the band), I leave you with two quick randoms. 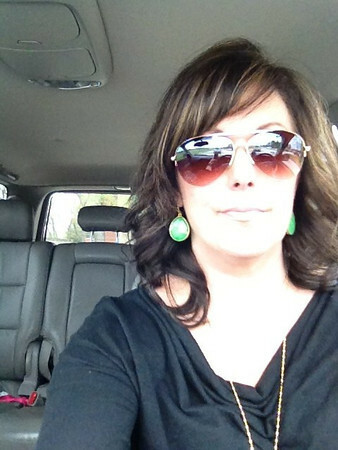 I'm obsessed with green earrings. Like I want to wear them everyday as a pop of color for no good reason other than I want to. 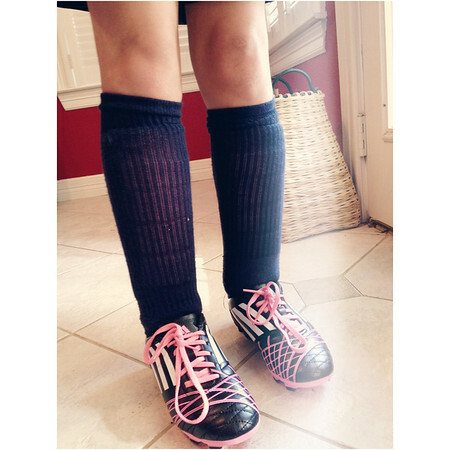 And soccer season has started. I love these little legs! Well, I guess they're not so little any more, long legs is more apt. Her first practice was tonight and she was glad (and so were we) to be with her same coach as last season (fall) and most of the same players (this is the third season for several of them to play together, which really lets them gel as a team and know each other's strengths). And that, my friends, is a wrap on this batch of miscellany. As always, your hair looks so good! I love those earrings, too. Just read BigMama's book while driving (well, riding) in the car for Spring Break. Have you read it? Thanks so much Anna! I have not read BigMama's book yet, but I might. I love her blog but just haven't broken down to shell out the $10ish for her book--ha!